To continue the definition of an EtlTool you have to define one field as an entity, and one field as a date. Otherwise you can not continue. An entity is a label you use to identify lines. 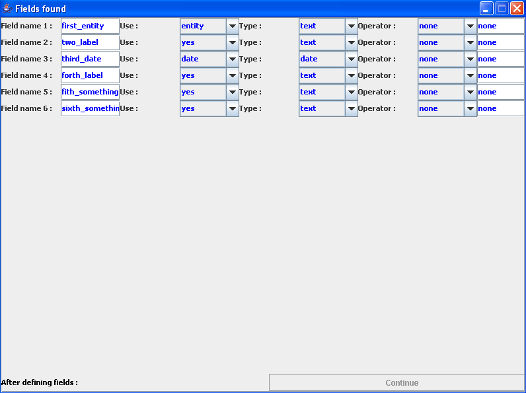 Benetl 2.6 brings types for the fields defined in EtlTool. An entity has a "text" type. A date has a "date" type. When you defined a use with "yes" then you can either choose "text", "date" or "numeric" as type. Benetl 3.6 brings new controls and messages. Don’t forget to type "enter" when you change a field name.